Born in Brooklyn, New York, Arthur S. Parker II was a minor league baseball player and U.S. Navy veteran prior to his time in the ski industry. 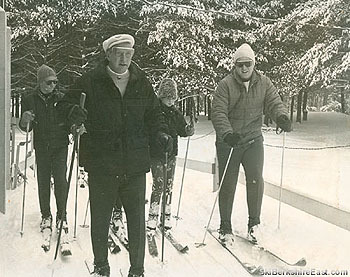 During the 1950s, Parker and his family would travel from their home in Connecticut to the Charlemont area and ski at Chickley Alp. On these trips, Parker looked at the mountain near the train station and decided to build a ski area. His first attempt was in developing the Thunder Mountain Ski Club, a small rope tow area on Mt. Institute. Legend has it that, due to a snow drought, this area opened for one day in February of 1954, prior to more bad weather moving in and a rope apparently being stolen. The official cause of closure of the venture was due to hurricane damage. Six years later, Parker was back on Mt. Institute, once again leasing land from Philip DiBenedetto of the Plantation House. Greatly improving on the original area, the new Thunder Mountain would feature a chairlift, two T-Bars, snowmaking, and top to bottom skiing for the 1961-62 season. Debt increasingly became an issue and, after a tough 1964-65 season, Richard Tambussi purchased half of the Thunder Mountain voting stock, thereby taking over the ski area. Tambussi would eventually rename the area Berkshire East. Parker would continue to ski Berkshire East over the years, including in the early 2000s after hip replacement surgery. His wife of 60 years, Viola, died in December of 2006. Arthur S. Parker II died a few months later at the age of 87.